For three days—January 21 to 23—South Africa’s top political and technical leadership in education converged at the Birchwood Hotel in Boksburg for the fifth session of the Basic Education Sector Lekgotla since 2015, under the theme ‘‘Equipping Learners with Knowledge and Skills for a Changing World’’. Quite astute actually, that the forum is referred to as a Lekgotla: A Setswana word referring to a sacred traditional open space fenced off by tree branches, or logs, or stones, normally in front of the Chief’s home. It’s an open space where village elders meet to reflect on important matters pertaining to the village, to plan the future of the village, and to preside over disputes and cases. The conduct of Lekgotla is open, serious, frank, unwaveringly democratic, consultative, and above all, egalitarian. Its true form and purpose is captured in the Setswana proverb: Mafoko a kgotla a mantle otlhe (within the confines of a kgotla, all words are equal and beautiful). Lekgotla is also a place where the chief convenes the tribe for celebrations and funerals of royals. 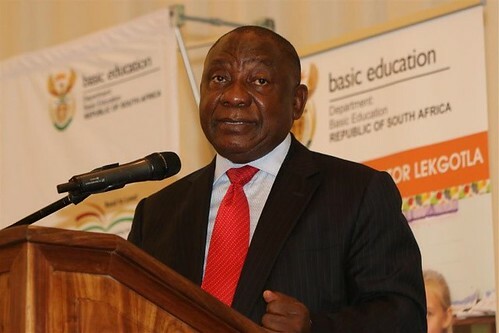 About 600 participants from the presidency, parliamentary committee on education, Umalusi, national and provincial departments of basic education, national electoral commission, academia, unions, civil society, parents, school governing boards, learners, and more gathered in Boksburg for the Lekgotla. 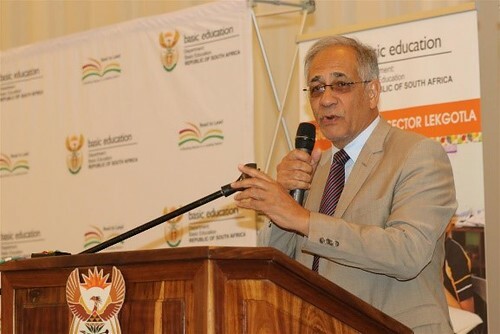 For what was to unfold into a robust broad-based national dialogue on the future of education in the country, the lekgotla started on a rather formal note with Deputy Minister Enver Surty calling Minister Angie Motshekga to the podium to introduce the first speaker, His Excellency President CM Ramaphosa. 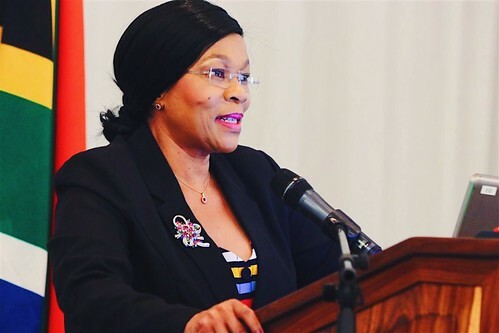 Appreciating that every child is an important national asset, this Lekgotla commits the government and its social partners to take our children on an exciting and meaningful journey of learning – from which our children will emerge with the knowledge and skills necessary to better respond to the challenges of a changing world. We must … build a citizenry that is conscious of, and committed to, the ideal of a truly united nation underpinned by non-racialism, non-sexism, democracy and shared prosperity. The [education] sector needs to support learners in improving their life skills relating to sexuality, care and support, and bullying. The basic education sector plan needs to focus on a number of critical areas. These include … developing capabilities in data analytics, coding, the internet of things and block chain technology. The Lekgotla was structured into three days of discussion. The first day consisted of three sessions under the sub-theme “Setting the Scene”, and featured a presentations on diverse topics ranging from Ubuntu to the Fourth Industrial Revolution. Day 2 focused on “Consolidation of Implementation”, and was made up of commissions detailing tangible applications to facilitate change in the education sector. Day 3 consisted of plenary sessions and a recap of highlights from the Lekgotla. A few plenary sessions received inputs from international speakers from Austria, Australia, the Philippines, the US, the Brookings Institution, Center for Curriculum Redesign, OECD, School Turnaround Foundation, UNISA, and IBE-UNESCO. Director, Dr. Mmantsetsa Marope, shared with the Lekgotla the global paradigm shift on the future of curriculum propagated by IBE-UNESCO. She underscored the IBE-UNESCO’s view that this shift is essential if curricula are to prepare learners (young and old) for “the 21st century where the only thing constant is change!” Dr. Marope also shared the IBE-UNESCO’s global competence framework, underscoring the Bureau’s conviction that all global citizens will need these competences if they are to effectively take up unknown future opportunities and face equally unknown future challenges. She highlighted the seven macro competences that are intended to afford curricula the stability required for their reforms to take root and register the intended impact and learning outcomes. She also shared examples of micro competences under each macro competence, pointing out that it is within the micro competences that curricula find their agility to adapt to relentless, disruptive, and mostly unpredictable drivers of change in the 21st century. Dr. Marope took pause to reflect on the demands that Industry 4.0 (I4.0) continues to place on curricula, impelling them to be lifelong learning systems in their own right or be obsolete and impotent instruments than cannot possibly prepare learners for the future. She characterized I4.0 as a formidable accelerant of change underpinned by the permeation of technology across all facets of human life as we know it now. The plenary sessions tackled diverse themes deemed by the Director General of Basic Education Mr. Mathanzima Mweli and his team as pertinent for informing focused deliberations that took place in the following nine commissions: Languages; BCM and Services subjects; MST and Arts and Culture Subjects; Early Childhood Development, Inclusive Education and Rural Education; Teacher Development, ICT, LTSM and EMGD; Exams and Assessment; Social Cohesion; Current and future competencies and curriculum; and Finance, Human Resources and Infrastructure. Judging from the heated debates that followed, the commissions were perhaps the most important part of the program. They afforded senior education professionals the intellectual space to reflect on inputs received from plenary speakers, select what they believed made sense, and craft very pointed recommendations for implementation and report-back during the next Lekgotla in 2020. The plenary session that followed the commissions was nothing other than a Lekgotla! Many sound recommendations and decisions were made. Key among which was the adoption of the IBE-UNESCO’s global curriculum framework. Stay tuned for the final report on the fifth session of the Basic Education Sector Lekgotla.